The temporary intervention passive park we realised under the Paulinen-Bridge, where a filling station with a highly frequented shop is opposite to a car park. This periphery in the centre is occupied by those who have found their place, i.e. parking space, at the edge of the consumer society. Before this spot also falls victim to an inability to tolerate the few remaining impudent spaces in the city landscape, we invite to a garage party. 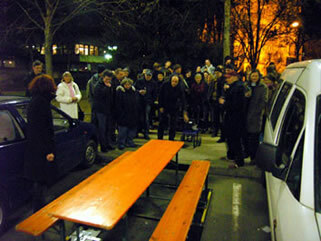 On one of the parking places we install an ale-bench. A motor, driven by a power stand-by unit sets the benches going and moves them back and forth. Canned beer is bought at the filling station. 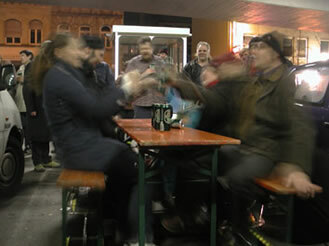 In the noise of the generator the automatically swaying ale-bench keeps the audience in motion and is reminiscent to the singularities of organized cheerfulness.